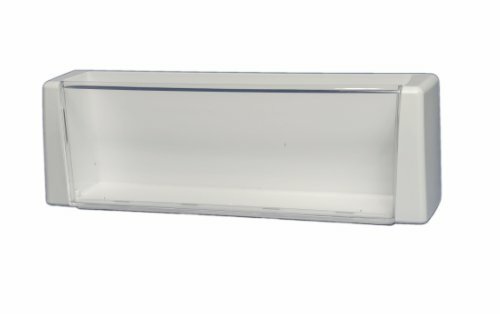 LG AAP33726606 Refrigerator Door Shelf/Bin. White plastic with clear trim. For use with the following LG Electronics models: LMX25981SB, LFX25975ST, GRL25AUQXP, GRL25AUVXP, LMX25985ST, LMX25985SW, GRL258SSWQ, LFX25961ST, LFX25971ST, LFX25961SW, LFX25971SW, GRL218USGH, GRL25AUSJH, GRL25AUSJP, GRL218USJH, GRL218USJP, LMX21984ST, LMX25981ST, LMX25981SW, LFX21975ST, GRL258UQGH, GRL258UVGH, GRL258UQJH, GRL258UVJH, GRL258UQJP, GRL258UVJP, GRL25AUSXP, LFX21971ST, GRL21AUSJH, LMX21981ST, GRL258SQWQ, GRL258SVWQ, 78753, LFX25961AL, GRL258USGH, GRL25AUQJH, GRL25AUVJH, GRL25AUQJP, GRL25AUVJP, GRL258USJH, GRL258USJP, LMX25984SB, GRL258USLH, LFX25975SB, GRL21AUSXP, LMX25984ST, LMX25984SW, LFX25975SW, LMX25985SB, LFX25961SB. Refer to your manual to ensure ordering the correct, compatible part.